When Sam Houston became the first elected president of the Republic of Texas in 1836, the new country was recovering from a tough-fought war for independence from Mexico. In December of 1838, the young Republic of Texas would readily welcome its first peaceful transfer of power. Even as Sam Houston gave his farewell address to his constituents, Mirabeau B. Lamar’s government was already on the job. In fact, Lamar was so anxious; he gave his acceptance speech to his secretary, while he left for work. One of his first actions Lamar had was to sign that day’s bank notes. In Texas! The Exhibition, you are able to observe two particular bank notes printed and dated on Lamar’s day of acceptance. The Presidential Transition Notes in the exhibit displays notes from the morning signed by President Sam Houston and notes from the afternoon signed by President Mirabeau Lamar. These common notes, however, do not reflect Houston and Lamar’s opposing governmental policies. 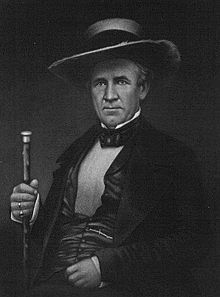 Sam Houston was the Major General of the Texas army during the Texas Revolution. Once Texas won its independence, he was elected as the first President of the Republic by a landslide. His opponent was another Texas icon and well known man at the time, Stephen F. Austin. President Houston immediately began work building the Republic of Texas. However, Houston was in favor of annexation to the Untied States for several reasons. Houston hoped that annexation would provide much-needed funds for Texas. Also with the United States’ protection, Texas could avoid another war with Mexico, as there were still questions about Texas’ southern border. Since most of its inhabitants were U.S. citizens, annexation would not be a radical change for the people. He was also in favor of reducing the Texas’ military spending. President Houston would continue to hold Texas’ purse strings tight and push for annexation throughout his two year term. Houston, who had a past connection with the Cherokee Indians, was very compassionate in his dealings with the Native Americans. He understood their love of the land and desire to live as they wished. As president, Houston would negotiate several peace treaties with Native Americans throughout Texas. President Houston’s vision for the Republic was altered just as it was being fulfilled. The Texas constitution was written to avoid giving any one man too much power. Therefore, Presidents could not serve two consecutive terms. For Houston, this meant he must hand over the reins. This transfer of power, while the first peaceful one in Texas’ history, was made to a man with beliefs profoundly dissimilar to his predecessor’s. Mirabeau Lamar had been a private in the Texas Army and was later promoted to Colonel due to his bravery. He was placed in charge of the cavalry before the Battle of San Jacinto by then General Sam Houston. After the war, Mirabeau Lamar was elected Vice President of the Republic of Texas. 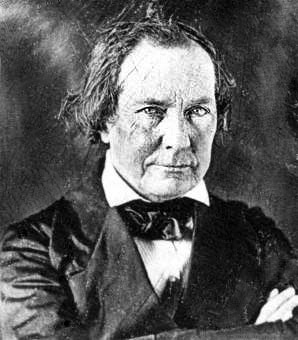 According to the Texas Handbook online, Lamar spent most of his vice presidency touring Georgia and speaking about the new Republic of Texas. With President Houston’s term coming to an end, Lamar decided to run for President. Mirabeau Lamar’s two opponents in the presidential campaign committed suicide shortly before the election, thus giving him a unanimous victory. From the day of his inauguration, the policies of Republic of Texas did an about-face. Lamar preached that it was Texas’ destiny to expand to the Pacific Ocean. He had no desire to see Texas become part of the United States. He also pushed for Texas to build up its Navy to help protect against Mexico. Some of President Lamar’s lasting accomplishments lay in the area of education. Lamar created a public school and university system that still flourishes today because of land, which had little worth at the time, he had set aside to be used as an endowment. For this, he was nicknamed “Father of Texas Education.” Lamar once said to Congress, “Cultivated mind is the guardian genius of democracy,” which was translated into Latin and became the motto of The University of Texas. Another lasting impact of Lamar’s term in office was the movement of the capital of Texas from Houston to Austin. Austin has been the home of the capital since October 1839. By the end of his term, Lamar’s ambitions left the Texas Republic in near bankruptcy. Sam Houston once again took office in 1841. With the Texas paper currency worth only pennies to the U.S. dollar, Sam Houston once again advocated annexation to the United States. Houston would restore economic control in Texas, and the Republic would finally become part of the United States one year after his second term ended. Both Sam Houston and Mirabeau Lamar were extraordinary men that shaped the landscape of what Texas is today. The two transitional notes on display in Texas! The Exhibition are a fascinating reminder of these two significant leaders of the Republic of Texas. On that day in December of 1838, these identical notes were printed, but the signature at the bottom represented two very different political administrations and ideals. Don’t miss your chance to see Texas! The Exhibition, on display at the Houston Museum of Natural Science through September 7. Amanda is responsible for TEKS based curriculum development as well as leading the teams tasked with marketing, scheduling, and hosting field trips from the 53 area school districts that regularly visit the museum. She also helps create staff development classes for educators seeking to meet state requirements for their teacher or gifted and talented certifications. Amanda taught Texas and U.S. History for over seven years in Fort Bend ISD. Amanda has a degree in History from the University of Texas at Austin. Previous Post Name Our New Corpse Flower: Voting Time!